Full Spectrum Curcumin, 60 liquid extract softgels (Solgar®) - Penn Herb Co. Ltd.
Solgar® Full Spectrum Curcumin is faster absorbed, better absorbed, and longer lasting than ever before! In a recent clinical study, Solgar® Full Spectrum Curcumin was shown to be longer lasting so it stays in your system for a full 24 hours. Now, for brain, joint and immune health - Solgar changes what you believed was possible from curcumin. 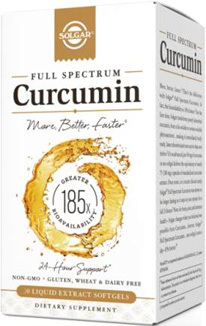 For the first time, Solgar transforms poorly absorbed curcumin, from a fat-soluble to a water-soluble phytonutrient... making it immediately body-ready, faster absorbed and more active than ever before. It's so advanced, just 40 mg of curcumin in one softgel delivers the equivalency of 75 (100 mg) capsules of standardized curcumin extract. AMOUNT PER SERVING (1 LIQUID EXTRACT SOFTGEL): Full Spectrum Curcumin Liquid Extract Providing: Total Curcuminoids 48 mg, Curcumin 40 mg. INGREDIENTS: Full Spectrum Curcumin (Polysorbate 80 [emulsifier]), Turmeric Extract (Curcuma longa [rhizome]), Gelatin, Vegetable Glycerin. FREE OF: Gluten, Wheat, Dairy, Soy, Yeast, Sugar, Sodium, Artificial Flavor, Sweetener, Preservatives and Color. As a dietary supplement for adults, take 1 softgel daily, preferably with a meal or as directed by a healthcare practitioner. SEE PDF FOR CAUTIONS.